If you'd like to take part in the Bitcoin craze but don't want to pay exorbitant prices or mine them yourself, you could use Bitcoin lotteries to try to win them. Here's how to do it. Bitcoins are a type of alternate currency called "cryptocurrency." Cryptocurrency is a token, or chunk of computer code, that has monetary value and which is traded like regular currency. Unlike regular currency, it doesn't rely on banks or other financial institutions. It is highly anonymous, which means that it can be used for transactions which are dubious in nature, but Bitcoins are also accepted by some retailers and other legitimate organizations. Bitcoins are produced through a process called Bitcoin mining. 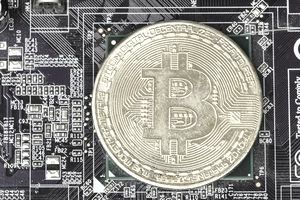 Bitcoin mining involves computers working to quickly solve a type of mathematical puzzle that becomes increasingly difficult as more Bitcoins are decoded. To mine Bitcoin successfully, you need a computer with extremely fast processing power, which means that it is resource intensive. And the number of Bitcoins is limited, which means that you could spend a lot of money on hardware and electricity costs with no return on your investment. Bitcoin mining is attractive despite its risks because the coins can be extremely valuable. For many years, each Bitcoin was worth only a couple of hundred dollars, but in 2017 the price per Bitcoin had risen to nearly $20,000. The meteoric rise in Bitcoin value led to some high-profile rags-to-riches stories including that of Kristoffer Koch who bought 5,000 Bitcoins for $27 when he was researching his thesis in 2009. In 2013, when Koch remembered that he had the Bitcoins in an encrypted Bitcoin wallet, they were worth over $880,000. The article states that he used 1,000 of those Bitcoins to purchase an apartment, but if he held on to the other 4,000 and sold them at Bitcoins' peak, they would be worth nearly $8,000,000. The jump in value started a Bitcoin craze, which of course made the value climb even higher. Most people would love to get their hands on Bitcoins. but trading them is risky, mining them is expensive, and a time machine to go back to 2009 to buy them for pennies hasn't been developed yet. So Bitcoin lotteries are an attractive idea. A Bitcoin lottery works like Powerball or Mega Millions lotteries do: players purchase a ticket in the hope of hitting a jackpot. The difference is that you can choose to have your jackpot paid out in Bitcoins instead of cash. If you believe that cryptocurrency prices will continue to rise, then hitting a Bitcoin jackpot can be even more valuable than receiving the same dollar amount in cash. Lottoland.com offered the first Bitcoin lottery. To play, you pay 3.50€ per ticket (you can get discounts for buying tickets in bulk). You then pick six different numbers between 1 and 49 or use the Quick Pick option to have the numbers chosen randomly for you. Lottoland doesn't draw winners, but rather uses the numbers drawn from Spain's Bonolotto, which reduces the chances of impropriety with the winner selection process. The odds of winning the Powerball jackpot are 1 in 292,201,338, so about 20 times harder to win (though of course, the Powerball jackpots are larger as well). As with most lotteries, prizes are split among all of the tickets with the correct numbers. If you're wondering whether Lottoland is a scam, the prizes are awarded regularly (though of course, the odds of winning are long). The company has an insurance policy that pays out when winning numbers are selected and the ticket prices cover the cost of the insurance premiums. Can You Win the Bitcoin Lottery If You Don't Know Anything About Bitcoin? If you are nervous about dealing with cryptocurrency if you win a Bitcoin lottery, you don't need to be. Lottoland promises that they will help their Tier 1 and Tier 2 winners set up a Bitcoin wallet if they need one. If you don't want to do that or if you are not confident that the Bitcoin value will rise after you win, you can also choose to receive the prize at the current cash value at the time you win. If you don't want to go through Lottoland, or you don't live in a country that is eligible to play, Grizzle lists five other reliable Bitcoin lotteries. You could also use a Bitcoin faucet, which is a profit sharing scheme that pays out a few Satoshis for performing various activities like playing games or entering CAPTCHAs. These payouts are usually funded by advertising, or work as advertising for a site or product. A Satoshi, named after the purported creator of Bitcoins, is worth a hundred millionth of a single Bitcoin. Obviously, that's not much, but it costs you nothing but time. On the other hand, spending that time simply entering cash sweepstakes might be more lucrative.